Megaloblastic anemia is a type of anemia which is characterized by morphologically abnormal (unusually large and immature) red blood cells known as megaloblasts. Megaloblastic anemia has several different causes – deficiencies of either cobalamin (vitamin B12) or folate (vitamin B 9) are the two most common causes. These vitamins play an essential role in the production of red blood cells. The specific symptoms present in each individual can vary greatly. The initial neurological symptom may be tingling or numbness in the hands or feet. Over a period of time other symptoms develop like balance or gait problems, vision loss due to degeneration (atrophy) of the optic nerve and mental confusion or memory loss. Several psychiatric abnormalities including depression, insomnia, listlessness, and panic attacks may also occur. Folate deficiency generally does not result in neurological symptoms. Vitamin B12 is naturally found in animal products, including fish, meat, poultry, eggs, milk, and milk products. It is generally not present in plant foods. It is synthesized by bacteria many of which are normally present inside the human large intestine. However, it is not absorbed from this site and hence humans are entirely dependent on dietary sources. Dietary B12 is protein-bound. When the protein-B12 complex reaches the stomach, the stomach secretes acids and enzymes that detach the B12 from the protein. Another protein, R-protein (also known as transcobalamin I) picks up the B12 and transports it through the stomach and into the small intestine. The stomach cells also produce a protein called intrinsic factor (IF), which travels to the small intestine and attaches to B12. The cells lining the ileum contain receptors for the B12-IF complex and thus B12 gets absorbed from the ileum. The B12-IF complex protects the B12 against bacterial and digestive enzyme degradation. In addition to the IF mechanism, passive diffusion of B12 also occurs and accounts for 1-3% of B12 absorbed by the body. After B12 is absorbed into the intestinal cells, it attaches to transcobalamin II (TC2) which then transports it to all body tissues through the blood and cerebrospinal fluid. Once the B12-TC2 complex arrives at the cell where it is needed, B12 is released from TC2 in the form of hydroxocobalamin. It is then turned into methylcobalamin or adenosylcobalamin and used for their respective enzymes. The principal site for storage of vitamin B12 is the liver. If the circulating B12 exceeds the binding capacity of the blood (as after B12 injection), the excess is excreted in the urine. The fundamental defect in pernicious anemia is a failure of secretion of intrinsic factor (IF) by the stomach due to permanent atrophy of the gastric mucous membrane. In the absence of intrinsic factor, the vitamin B12 of food is not absorbed resulting in vitamin B12 deficiency. Folate is widely distributed in plant and animal tissues. The richest sources are liver, kidney, yeast and fresh dark green vegetables like broccoli and spinach and dried legumes such as chickpeas, beans, and lentils. Milk has moderately low folate content. Cooking in large quantities of water causes a loss of 60-90 % of folate present in food. Folate is normally absorbed from the duodenum and upper jejunum and to a lesser extent from the lower jejunum and ileum. Absorption of synthetic folic acid is a rapid active process. Folates circulate in the plasma as methyltetrahydrofolate monoglutamate. They are mainly stored in the liver in the polyglutamate form. Liver and red cell folate is predominantly methyltetrahydrofolate polyglutamate. The total body content is 5-20 mg and stores get exhausted in about 4 months if intake totally ceases. The underlying feature in megaloblastic anemia is a block in DNA synthesis in rapidly dividing cells. This occurs due to inability to methylate deoxyuridylate to thymidylate in the DNA synthesis pathway. The methyl group for the deoxyuridylate – thymidylate step is supplied by the folate co-enzyme, methylenetetra-hydrofolate. 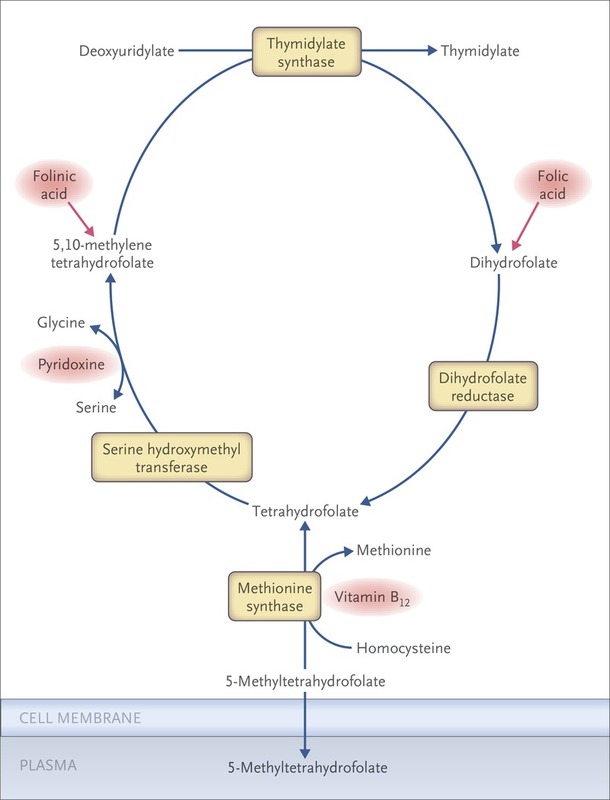 Deficiency of folate due to any cause reduces the supply of methylenetetra-hydrofolate and thus interferes with the conversion of deoxyuridylate to thymidylate and the synthesis of DNA. Block in DNA synthesis and, to a lesser extent, RNA and protein synthesis results in impaired cell division since nuclear maturation is arrested. Nuclear maturation is immature relative to cytoplasmic maturity resulting in unbalanced cell growth. Megaloblastosis describes a heterogeneous group of disorders that share common morphologic characteristics – large cells with an arrest in nuclear maturation. These immature cells that can be seen in bone marrow aspirates and in peripheral smears have been called megaloblasts. Megaloblastic changes are most apparent in rapidly dividing cells such as blood cells and gastrointestinal cells. More mature RBC precursors are destroyed in the bone marrow prior to entering the blood stream (intramedullary hemolysis). Lab diagnosis of megaloblastic anemia involves the following sequential steps. Recognition of anemia and megaloblastosis: confirmed by blood indices and morphological examination of RBCs. Identification of specific vitamin deficiency: by measuring levels of serum vitamin B12 and folate along with RBC folate levels. Identification of the specific disease entity causing vitamin deficiency: carried out by tests of absorption and gastric function. Decreased hemoglobin levels and red blood cell (RBC) count. Many cases of megaloblastic anemia present with pancytopenia, ie, reduced levels of all the three formed elements of blood. In such cases, besides anemia, total leucocyte count (TLC) and platelet count are also reduced. It is decreased due to the destruction of fragile and abnormal megaloblastic erythroid precursors (intramedullary hemolysis) resulting in ineffective hematopoiesis. RBCs show anisocytosis (increased variation in size) and poikilocytosis (variation in shape). An important feature of megaloblastic anemia is the presence of macrocytes (larger than normal in size). Abnormally shaped red cells including ovalocytes (oval-shaped RBCs) and macro-ovalocytes (large oval shaped cells) are usually present. Polychromatic RBCs, nucleated RBCs, and megaloblasts can also be seen. Presence of megaloblasts is the hall mark of megaloblastic anemia. Erythroid precursors have megaloblastic features. They are larger than normoblastic cells. Also, nuclear maturation lags behind cytoplasmic maturation. These changes are most prominent in more mature RBC precursors. The neutrophil precursors show giant forms. Megakaryocytes may be large and hyperlobulated. Although not routinely needed to make the diagnosis of megaloblastic anemia, bone marrow examination can be carried out to rule out other causes of pancytopenia like leukemia or myelodysplastic syndromes. It can also be used to assess iron stores. Megaloblastic changes in bone marrow are reversed within 12 hours of treatment with cobalamin or folate, and bone marrow morphology returns to normal within 2-3 days. Therefore, bone marrow aspiration, if required, should be performed before the initiation of therapy. Red cells contain 20-50 times as much folate as serum. RBC folate is a more reliable indicator of tissue folate stores than the serum folate which fluctuates widely according to dietary intake. Serum homocysteine and methylmalonic acid (MMA) levels are helpful confirmatory tests for vitamin B12 and folate deficiencies. In vitamin B12 deficiency, levels of both are increased. In folate deficiency, levels of homocysteine are increased but those of MMA are not increased. These levels should be used if the clinical presentation and serum vitamin B-12 and folate levels are ambiguous. Serum Lactic Acid Dehydrogenase (LDH) Level. Levels are increased in megaloblastic anemia. Levels are increased due to the increased breakdown of hemoglobin. IF antibodies, type 1 and type 2, occur in more than half of patients with pernicious anemia. They are specific for pernicious anemia and can be used to confirm the diagnosis. Parietal cell antibody occurs in 90% of patients with pernicious anemia. Since they can also occur in thyroid disease and other autoimmune disorders, they are not specific for pernicious anemia. These should be performed to detect co-existent iron deficiency and to assess the need for iron therapy since iron stores can be exhausted during vitamin B12 or folate therapy. It was performed in the past to determine the ability of the body to absorb B12 by measuring the absorption of a small oral dose of radio-labeled B12. An advantage of this test was that it often included vitamin B12 with intrinsic factor. This test is rarely performed now-a-days. In chronic atrophic gastritis and pernicious anemia, level of serum gastrin is usually increased due to gastric achlorhydria. Appropriate testing may be carried out depending upon the clinical presentation to rule out or confirm the specific cause of malabsorption. It may be administered orally or parenterally (intramuscular). The advantage of parenteral administration over oral route is that all abnormalities in vitamin absorption are bypassed. Patients who have undergone either a total or partial gastrectomy should be started on replacement therapy after the surgery to prevent the development of megaloblastosis. It may also be administered orally or parenterally. Folate should be given prophylactically during pregnancy, lactation, and the perinatal period. It is also indicated in patients with chronic hemolytic anemias, psoriasis and exfoliative dermatitis, and during renal dialysis. Folate therapy should not be given in a patient with megaloblastic anemia if vitamin B12 deficiency has not been completely ruled out. This is because folic acid will improve the anemia but not the neurological complications of vitamin B12 deficiency which may even worsen. Both B12 and folate should be given if B12 deficiency has not been ruled out. This is indicated in cases of co-existent iron deficiency or when iron deficiency occurs in the course of treatment of megaloblastic anemia due to the consumption of iron stores for RBC production. This is indicated in very severe anemia. Patients should be instructed to consume folate and B12 rich foods. To prevent loss of folate, foods should not be cooked excessively and should not be diluted in large amounts of water. Clinical improvement begins immediately after the initiation of therapy. Increased levels of LDH and indirect bilirubin should fall rapidly. Reticulocyte count starts increasing within 3-5 days and peaks in 4-10 days. White cells and platelets return to normal range within few days but hypersegmented neutrophils may persist for 10-14 days. Hemoglobin level usually rises by approximately 1 g/dL per week. If it does not increase at approximately this rate, other causes of anemia should be considered and the patient should be further investigated. Serum potassium levels can fall during treatment for severe B12 or folate deficiency and can be fatal. Therefore, potassium levels should be monitored during treatment and supplements may be given, if required.